Once again this year the team of the Quebec Gay Archives took part in several of the activities of Fierté Montréal Pride during the month of August. The “Quebec Gay Archives at Cinéma du Parc” was an event in two parts presented at the Cinéma du Parc with the support of and during Fierté Montréal Pride. – From August 1 to 31 2018, an exhibition in the lobby of the cinema was composed of 26 posters on HIV/Aids, selected from the approximately 600 posters held by the Quebec Gay Archives. More than 14,000 people visited this exhibition, with free admission seven days a week. – On August 15 2018, the Quebec Gay Archives held a two-part public presentation in Salle 2, at the Cinéma du Parc. The lecture and film screening, along with the poster exhibition held August 1-31, were part an event celebrating the 35th anniversary of the Quebec Gay Archives. The evening began with a lecture by sociologist Gabriel Girard entitled “Sida, enjeux de mémoire, enjeux de savoirs”*. Following the lecture, the public was treated to the premier of the film “John Banks, une vie d’engagement”. This film was produced by the Quebec Gay Archives as part of an internship held by Alexis Baribeault (director of the movie). The Archives also received a community award from the Fierté Montréal Pride organization in order to produce a new promotional postcard highlighting a photo of the famous Guilda drawn from our collections, a new banner as well as newly designed T-shirts. Jean Logan, our long-time graphic designer, worked on all of these materials as well as those of the events at the Cinéma du Parc. The Archives participated, as usual, in the annual Community Day on August 18 with its own kiosk and were well represented in the 34th annual Pride Parade, held August 19th. Members of the group marched proudly beneath our new banner. 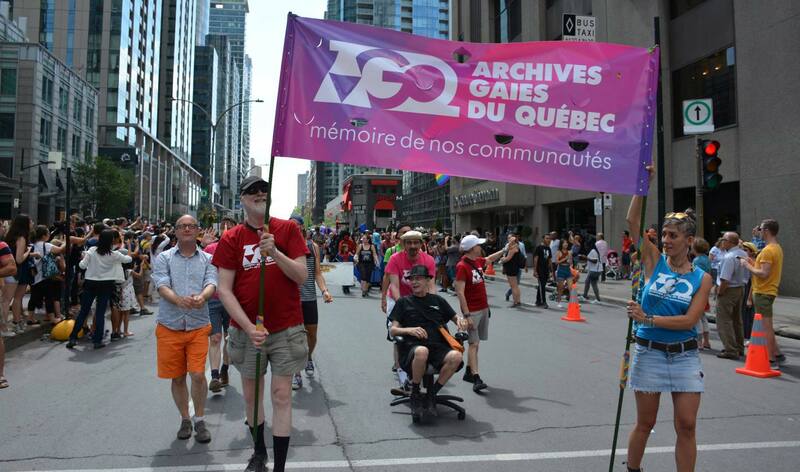 The Quebec Gay Archives thanks Fierté Montréal Pride for its ongoing support. Jacques Prince (cofounder and chief of the board), plus a volunteer from Fierté Montréal Pride. Also part of our team: Alexis Lemieux (volunteer) and other friends from Quebec Gay Archives. Photo Credit: André Querry / AGQ. All rights reserved.